Right now every recipe has pumpkin involved in it. 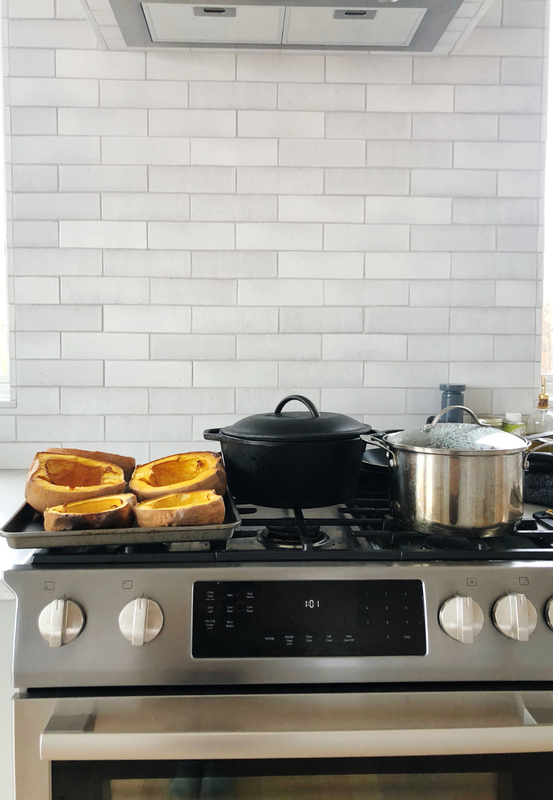 You may be heading to the store stocking up on Organic pumpkin for your upcoming holiday gatherings, but I want to tell you to hold tight and instead think about how we can be rethinking this super simple ingredient and making it right at home for less and with a lot more control. As I have gone down the route of eating more and more seasonally with our diet I have learned not only how much healthier this makes our life, but also how much we can actually save as well. Seasonal and local eating also lowers our footprint on the Earth. 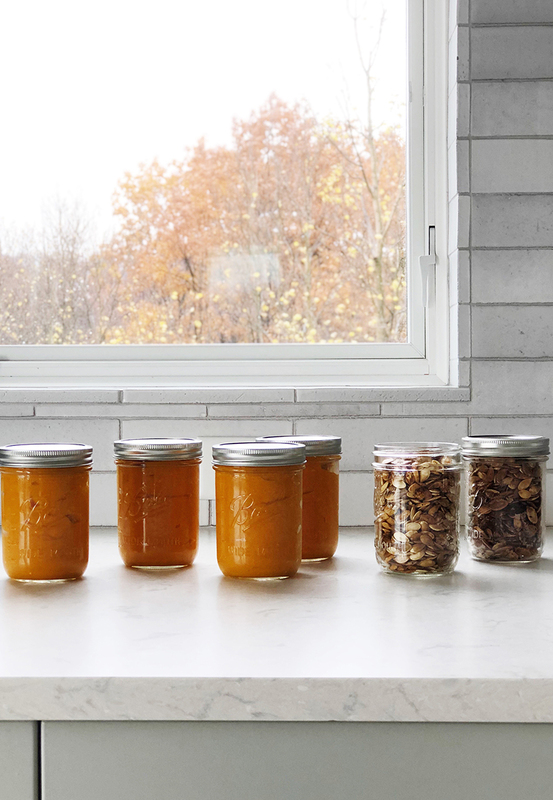 By putting things away into a freezer or canning them we can reuse jars from home and reduce our waste and recycling and we many times are the only transportation that vegetable will see in its lifetime from the farmer to our home. All of this together makes a big impact. So you may think that buying canned pumpkin is slightly more convenient, which I won’t disagree with, but as things surface about the Ocean’s warming at an even faster rate and that healthcare costs rise because of our diets and exposure to plastics etc, it starts making you think that maybe convenience could be catching up to us. At least I do. 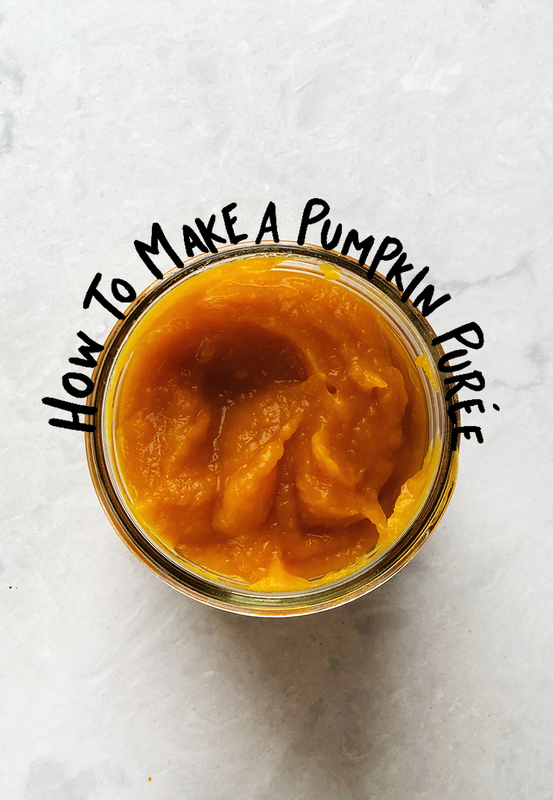 So yes, making your own pumpkin purée takes time and yes it is just pumpkin purée but every little bit helps in making our footprint on earth less. Not to mention it is nice to know that I don’t have to watch for a listeria outbreak on my canned pumpkin to surface in a few months. That said, this fall I purchased 3 organic heirloom pie pumpkins for $3 and when making this recipe they created over 5 15 oz (2 cups each) of pumpkin purée. The cost of the average can of organic pumpkin purée is $2 aka a $1 a cup of it and that doesn’t also equate the impact it had on the environment or the fact you have no idea what farm or who grew that sweet little pumpkin about to be your pie filling. That said my pumpkin came from the farmer I go to every year for pumpkins who grows them all summer naturally. I know his name and write a check every fall and thank him for his work. It also came out to $.30 a cup of pumpkin purée. So I saved $.70 a cup of purée which means I saved $7 on our pumpkin intake for the year. It doesn’t sound like a lot but this is just one of many ways that when we make the most of a season we can save money on our food bill and be very sure of what we are eating. Since many of you have wanted me to share how we save money by eating seasonally and locally, I wanted to share these simple recipes with you. The thing is that when you realize how simple this whole thing is and how you do it 1 time and you are done for the year you will realize just how simple shifting this practice can be. I find that the seasons usually lend to these types of routines in our year. When we need to preserve and put away a harvest the weather makes room for it with a rainy week or the first snow. In this case it was a really cold and rainy gray day that after a morning hike we spent the day making soup and making pumpkin purée for the upcoming holidays. We will have enough to make a pie at each holiday and plenty of other pumpkin goodies till we are sick of them and then we will wait till Fall again to enjoy them once more when they come back in season. Our house was extra warm that day as we made this and it took look to no time other than just being home. I placed about a whole 30 minutes into making this. I think that is worth it especially if it leaves your kitchen warm. Cut pumpkin open and in half. Then start scooping and cleaning the insides out. There will be seeds in here, which I suggest roasting and keeping for snacks especially when you will be having guests or even as something to take to a holiday dinner. They also taste wonderful on salads and more. 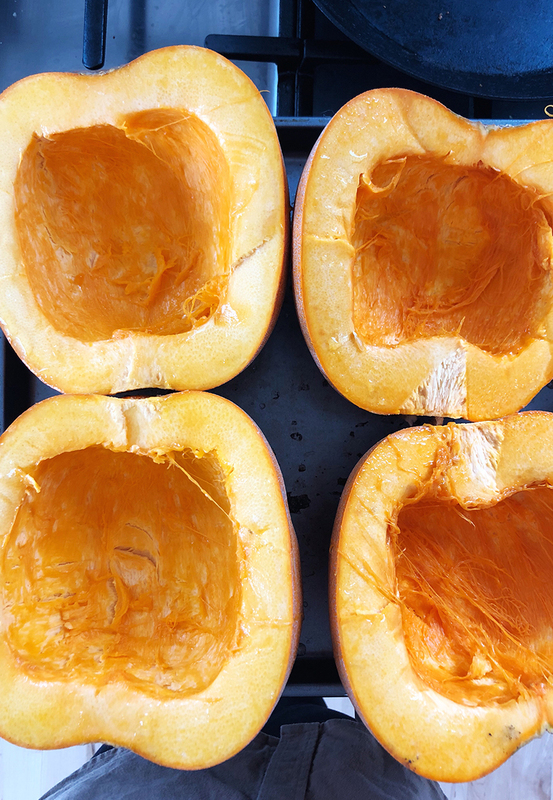 You can roast them while you are also roasting the pumpkins as well. They store in a jar for a few months once roasted. Once cleaned and halved you place them open side up and in the middle of your oven. Let cook in the oven for 20-40 minutes. I start checking them for doneness at 20 minutes and then every 10 minutes till the meat of the pumpkin is soft. Once fully cooked, remove from oven and allow to fully cool to the touch. When the pumpkins have cooled (I left mine for an hour or two), I get the jar/bowl for our blender and start removing the meat from the exterior skin of the pumpkin and scooping it in to be puréed. When you have it all in there, I add a dash of water to get it going. Sometimes I do have to add a little more to make it smooth, but it is usually about 1/2 a cup at most. Place in Ball Jars that are clean and sanitized up to the freezer mark if freezing. Once fully cooled (I place them in the fridge for 24 hours). I then transfer to the freezer for storage till we want to use them in the coming weeks. They last there for about 6 months. That is it. Nothing more complicated then making soup or even making crackers. It is quite simple and yields so much value. 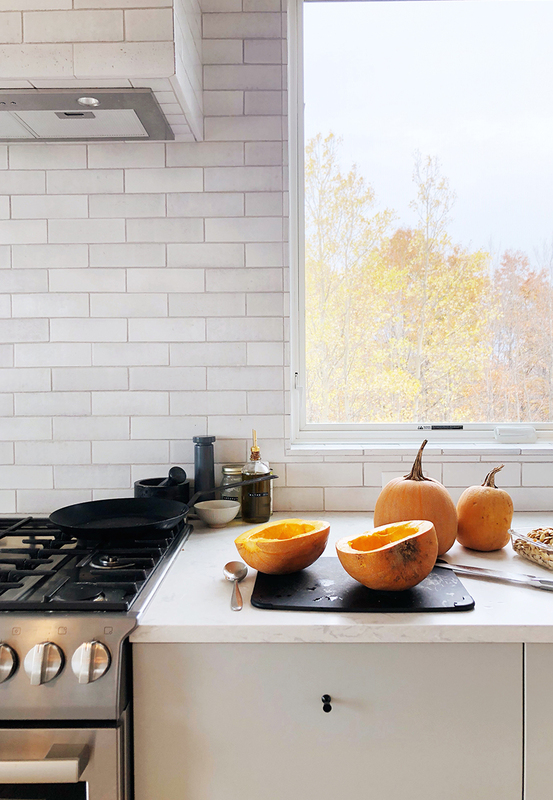 It is one of my favorite things to have our pumpkin roasting day in our home and to save these things for the weeks and months ahead. So have you ever made your own purée? Do you think you will do this this year?! Would love to hear! Here in France, you can forget about finding canned pumpkin purée. I make it myself, using the same method as you–cutting it in half and baking until soft. I’ve never needed to add water–I guess it depends on how much it has baked/dried out. I also freeze the purée, being a little nervous about canning. The French like their pumpkin savory, not sweet, and we have it regularly as soup. I also stir some into tomato Sauce for Pasta–it makes it nice and thick. The best thing about baking pumpkin in halves is that you don’t have to cut and peel, which is pretty hard. 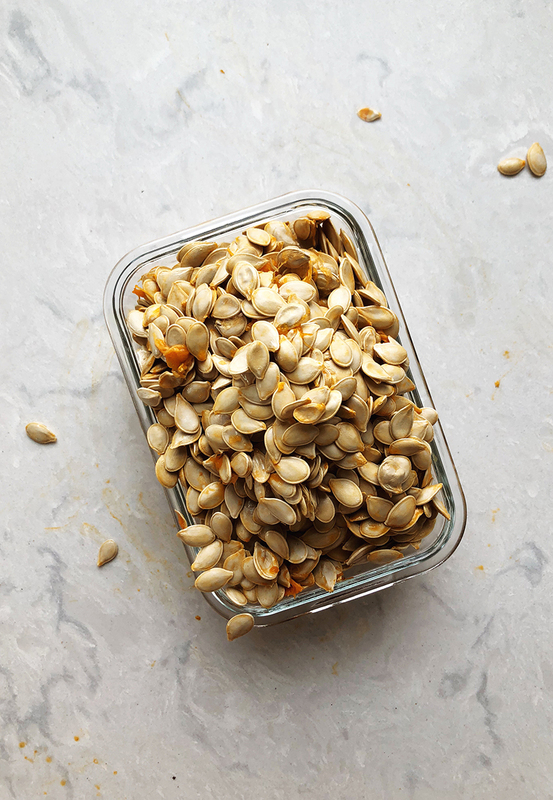 And then you get all those delicious pumpkin seeds to snack on! You’ve inspired me to make my own puree this year!! However the organic sugar pie pumpkin at my farmers market was $4 for one – such is life in California! Oh my goodness! Wow. That is just insane! So sorry about that but glad you gave it a try. I could send you pumpkins and still probably be cheaper.